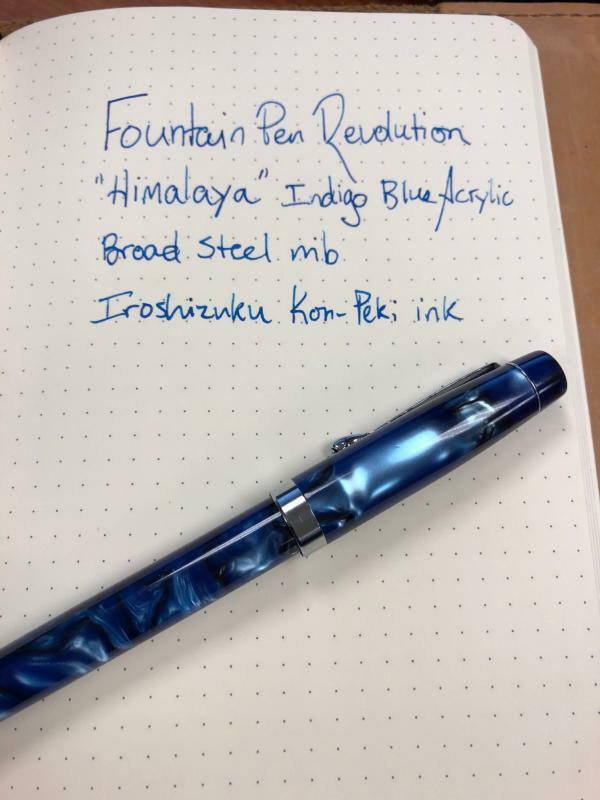 A while back, I purchased a fountain pen called the Indus from Fountain Pen Revolution. With that pen, you get an integrated, piston-filler (capable of full disassembly) with a very smooth steel nib with ebonite feed. However, that pen had some quirks (like a wiggly clip, a weird smell, and a very skinny grip) that made it less than perfect, even at that price point. I still like and use my Indus, mainly because of its most excellent nib, but I don't love it as much as I could. For those who don't know, Fountain Pen Revolution (hereafter FPR) is a brand dedicated to low-cost fountain pens, all of which are manufactured in India. India produces some excellent pens--evidenced by the fact that some well-known brands (Stipula and Esterbrook come to mind) rebrand and price-up lesser-known Indian brands for the US fountain pen market. FPR is run by Kevin Theimann, a wonderfully friendly chap who is likely to send you a personal email thanking you for making an order. He's good people, and I'm hoping he succeeds with this business model. After getting my Indus, and perusing some other models on the FPR site, I was intrigued enough to try again. This time, I went for the "Himalaya" model: A thicker pen than the Indus, with a push-pull piston converter (think Noodler's Neponset), and the same #5.5 steel nib and a larger ebonite feed. I chose the Indigo Blue acrylic finish. When I opened the pen, all I could say was "Wow." The blue acrylic is simply stunning, with deep chatoyance and multiple swirls of color. 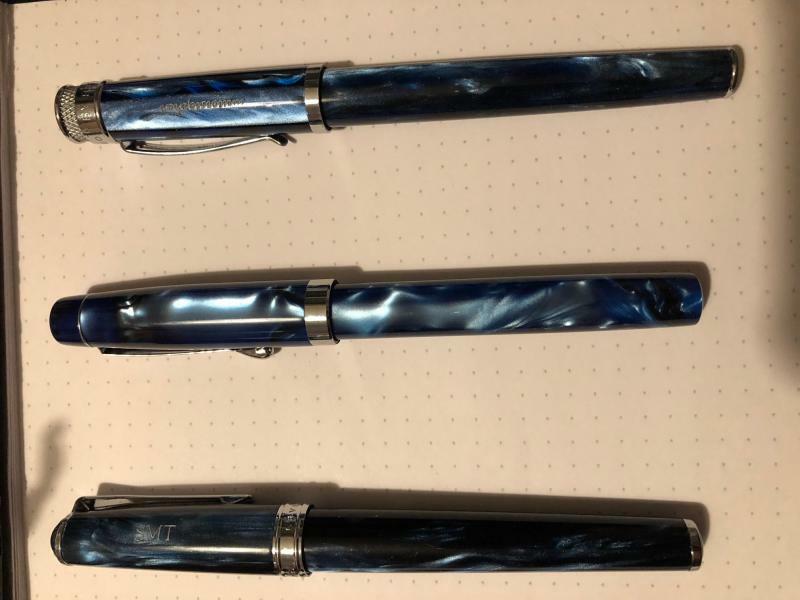 I have two other pens with similar finish: a Levenger True Writer Classic and a Retro 1951 Tornado, and the Himalaya is more beautiful than either of those. The pen is of medium length and width, I’d say; almost the perfect size. I have large hands, and it fits me perfectly. I’d wager smaller hands would find it just as comfortable. The screw cap can be removed in one full rotation, and posts securely with an almost undetectable click. Posted, the pen measures just about 6 inches, which to my mind is just about the perfect length for writing. The grip section is nicely tapered with a flare at the nib end to keep your fingers from sliding off onto the nib. I’d almost wish the nib were larger, but the way this nib writes I can’t complain about that. The pen’s converter works perfectly. It screws into the section and there was already some silicone grease on the threads to ensure a good seal. I’ll make a note to replenish that from time to time. I inked it with Pilot Iroshizuku Kon-Peki to match the pen’s aesthetic, and did a quick writing test. Again, wow. This pen writes. On a scale of 1 to 10, with 10 meaning the nib slips across the paper as if it were made of ice, I give it a solid 8.5. My Waterman Expert 3 medium is a 9, and my TWSBI Diamond 580 broad is a 9.5. The Himalaya is a very smooth writer, and it’s already destined for my regular EDC rotation. I keep coming back to the price of this thing, but I can’t ignore it. I can’t think of another pen under $30 that looks and writes as well as this one. And don’t give me Lamy Safari and Pilot Metropolitan, those pens are good and all, but *yawn*. This is a beautiful pen with character, one that you won’t be afraid to take to the boardroom, and also one you won’t be too afraid of losing. 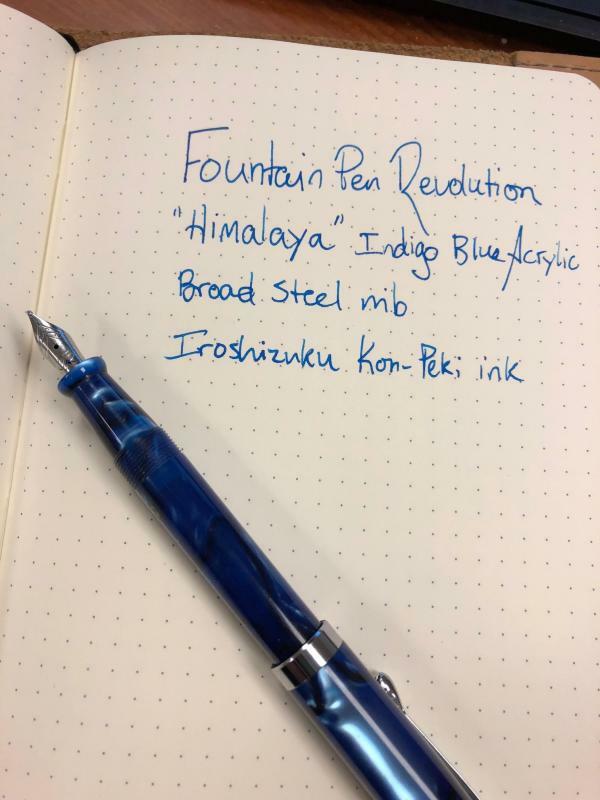 If you haven’t yet checked out FPR, I recommend you do so today: the site is www.fountainpenrevolution.com. Edited by writerstephen, 02 February 2018 - 22:51. I'm a fan as well. I love the look of the Acrylic versions and the feel of the Ebonite versions. It's a wet writer. The broad nibs are quite smooth. It's one of the very few pens I have that can handle and bring out the beauty of Kung Te-Cheng, and that's thanks to the ebonite feed and the good build. And there aren't many pens with ebonite feeds that are easily available in the US besides what FPR has to offer and Noodler's pens as far as I know (please correct if I'm wrong). I found the Ebonite Himalaya to be more robust than the Noodler's Konrad Ebonite. I found the Himalaya to be a robust pen in general. I like how the Himalaya's can be eye-droppered as well. If you happen to have a TWSBI Eco/Mini EF nib it works great with the Himalaya and lays down a beautiful rich line. I purchased a Himalaya last year and must say that I also am impressed by what you get for that amount of money (even including the shipping to Europe, this pen offers incredible value for money). Mine came with a flex nib and it is a joy to use. Regarding the weird smell you mention of your Indus: my Himalaya also smelled quite a bit. I think the smell is caused by the grease that is used on the threads of the pen and the converter. The smell more or less went away after I left the pen soaking in water with a bit of soap for a couple of hours. 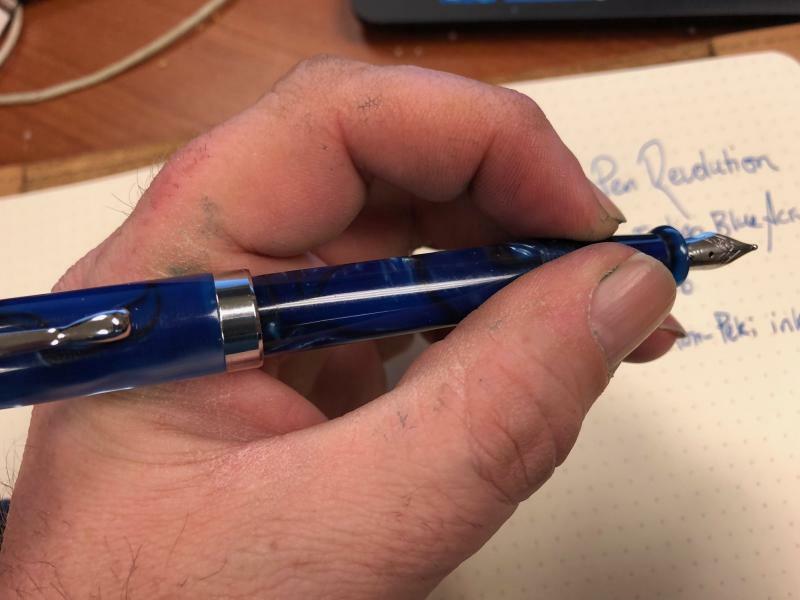 Thanks for a new review of this great pen! I hadn't seen the blue one up close like in your pics; it's really stunning! As someone with smaller hands, I can say that it feels absolutely perfect when not posted, but still sufficiently comfortable when posted. The lightness of these pens is a big plus. Another great thing about these pens which IndigoBOB bought up is the ability to put any JoWo #5 nib or various other similarly sized nibs in this pen. Mine is sporting a 1950s vintage German flex nib right now and writes so amazingly that it's staying put, thereby justifying my need to buy more Himalayas to use with other nibs. Thanks for the review - it's good to get another perspective on the Himalaya! 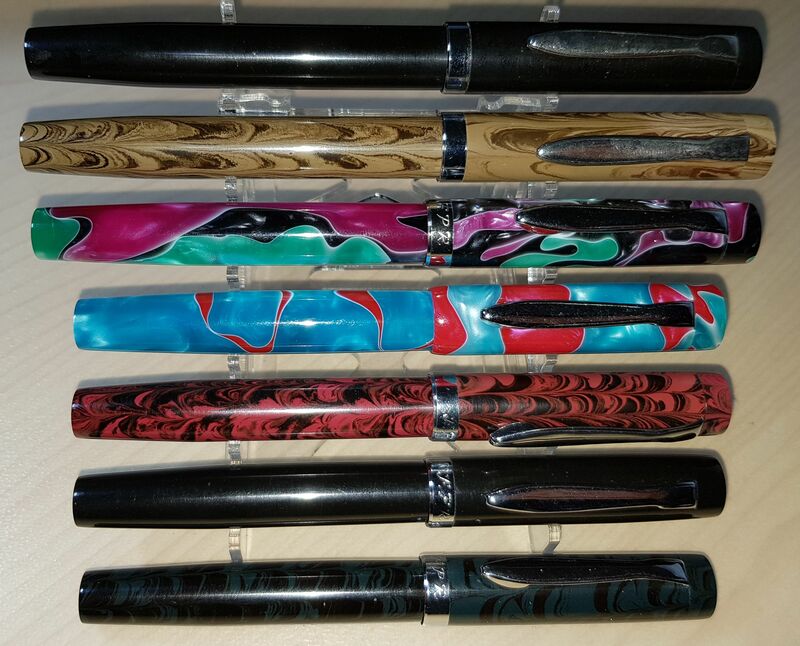 I now have 4 of them (3 acrylic and 1 ebonite), and will probably stop there, but... yes, these are great pens for the price! The depth and chatoyance of the acrylics (especially the blue and orange pens) is stunning, and the ebonite versions are pretty good looking too. 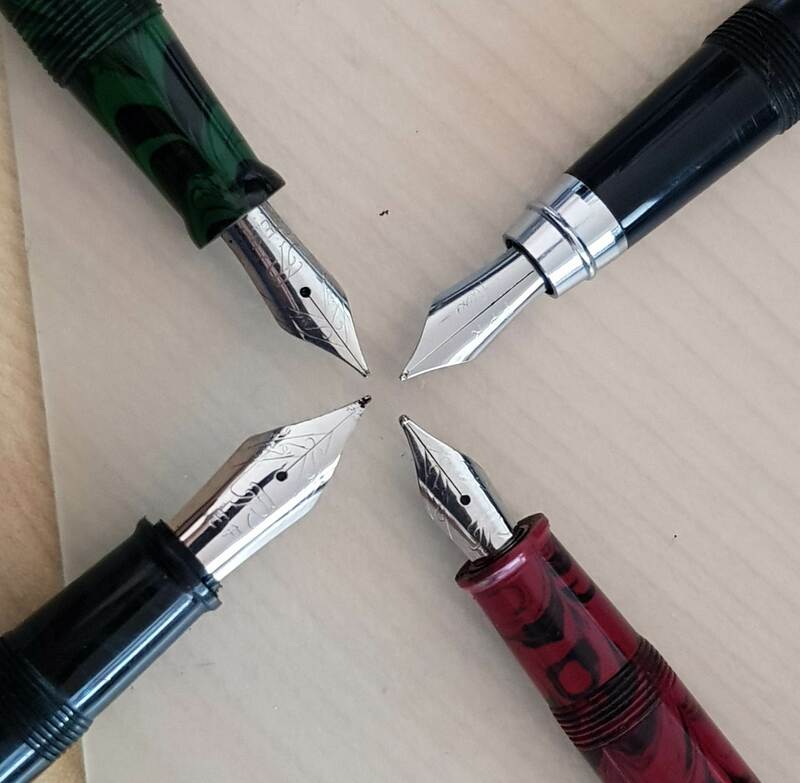 I currently have 3 of them inked - one with a FPR EF nib, one with a JoWo "arrow" nib, and one with a regular JoWo #5 (architect grind by fpnibs.com). Thanks for the replies folks. Heres a pic of the Himalaya, center, compared with the True Writer, bottom, and the Tornado, top. Edited by writerstephen, 04 February 2018 - 04:08. I have the brown ebonite model. It's a great, great pen. was tuned perfectly with the flex nib out of the box. Two other things I neglected to mention (though most of you already know): The Indus sells for $19; the Himalaya, $29. Needless to say, theyre both worth every penny and quite a bit more. Edited by writerstephen, 04 February 2018 - 09:54. I have an ebonite Himalaya and it is indeed a fine writer. However, I would love for FPR to introduce the ebonite Himalaya II, which would have a #6 nib with a bit larger (longer) barrel and sell for approx. $55. Would definitely purchase!!! There is something a bit underwhelming about a #5 nib. And with a german nib... like what ASA is doing in offering both Ebonite Feed versions as well as 3-in-1's with Schmidt or Jowo screw in units. 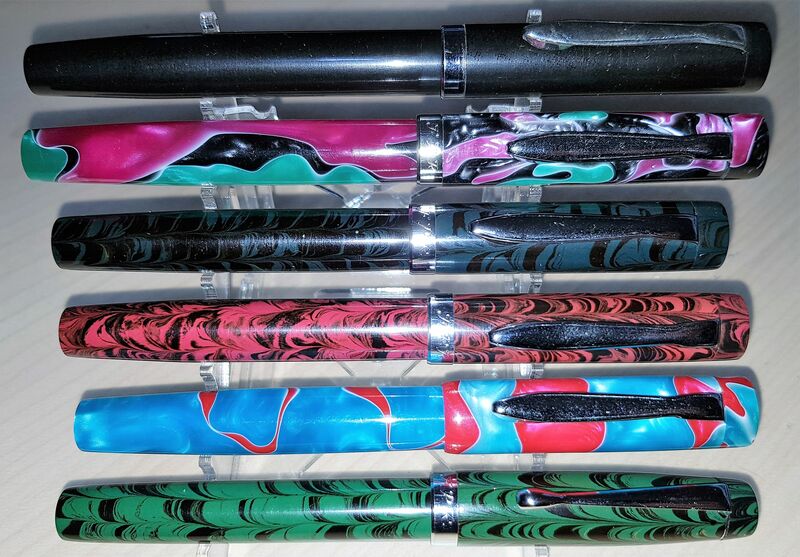 Check out their new ebonite Triveni pens, which have been redesigned to take a #6 nib. I *think* the feed is plastic, but will know when my order (for a Triveni Junior) arrives, hopefully later this week! If it can fit a Jowo, I might have to pick one up. I've had a saffron Himalaya for about 4 months now, love the chatoyance on the body, which for the cost is amazing. Mine has the flex nib, which is great, semi-flex in line width variance, and without the risk of springing. Edited by dapprman, 05 February 2018 - 00:08. OK, for those of you who've been expressing an interest in a #6-nib-sized version of the Himalaya, here are a few shots of my new FPR Triveni (Jr) in ebonite - with a #6 nib. I'll try and get a full (shortish) review of the Triveni up in the next few days - in the meantime, let me just say I'm pretty with how it's handling thus far! The feed on the Triveni is plastic, not ebonite, but it has a generous flow (the EF nib notwithstanding). Thanks, Jamerelbe! Those are some very helpful comparison shots! Don't the various Triveni brothers all have plastic feeds instead of ebonite? Part of the appeal for the Himalaya, Jaipur, and Guru is that lovely wet ebonite feed. Yes, the Trivenis all use plastic feeds - taking their 'lead' from the original pen, which was built around a Serwex MB grip section. 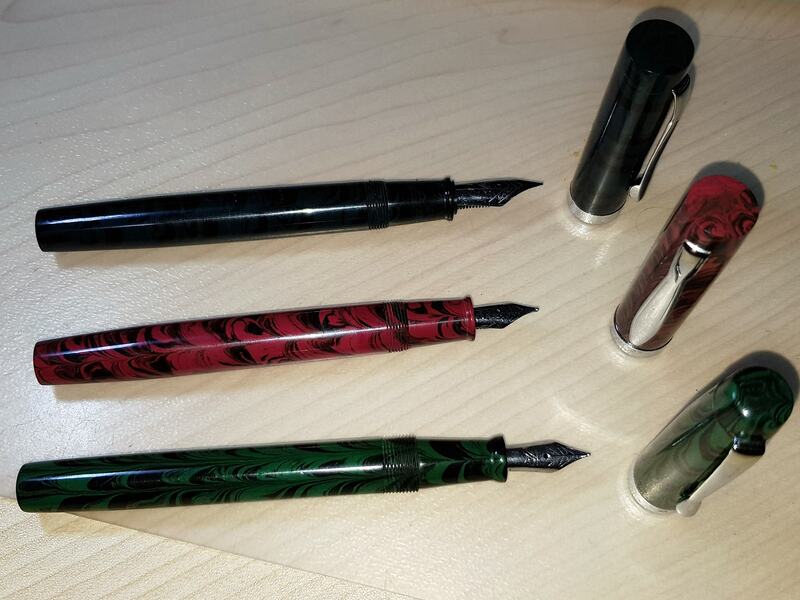 At this stage FPR don't offer any of their own pens that combine a #6 nib with an ebonite feed. I have to say, though, as much as I enjoy ebonite feeds, I find their plastic-feed pens wet enough - and a bit less prone to seepage into the cap! The other thing to consider (this'll be a 'pro' for some and a 'con' for others) is that the Triveni takes a standard international converter (or cartridges), rather than the pump-action piston filler of the Himalaya. It can also be eyedroppered, depending on your preference. Oh, and it's about $9 more expensive (for the ebonite, and even more so for acrylic) - but I say it's still worth it, if that kind of pen 'floats your boat'. Wow, an decent ebonite pen that could take international cartridges. Edited by TruthPil, 09 February 2018 - 15:35. Thanks a lot for that comparison ... I’ll be very interested to hear how that #6 writes, and how the new Triveni posts.